Dining with Dani is now on Facebook! Go here to like the page and get more updates about what’s cooking in the kitchen! 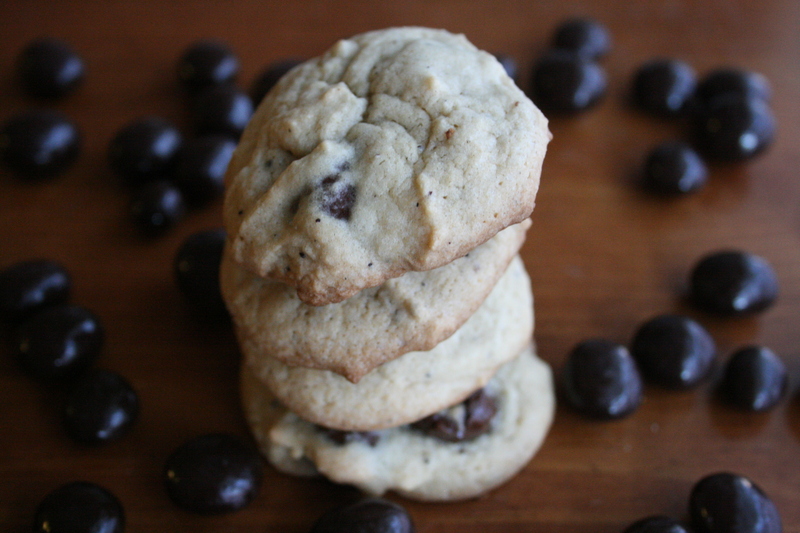 I came up with the idea for these cookies while I was sitting in line for the film festival and knew I had to make them for this month’s The Leftovers Club. In case you missed last month’s post, The Leftovers Club is the baked good exchange club between food bloggers. On the first Thursday of every month we take what we’ve made and ship it to another blogger to eat. I was so excited about the prospect of the cookies that I forgot the author of Healthy Delicious was going to receive them. They are delicious, but probably not so healthy. Sorry, Lauren! It took me three attempts to get these cookies right. On the first go around, my puppy jumped up on me while I was adding salt to the batter. This wouldn’t have been a problem except the Kitchen Aid mixer was spinning when it happened so you can imagine how lovely those tasted. The next time I added too much syrup and not enough baking powder and the cookies came out in one, big flat sheet. Finally I realized what they needed was a little chilling time before baking. 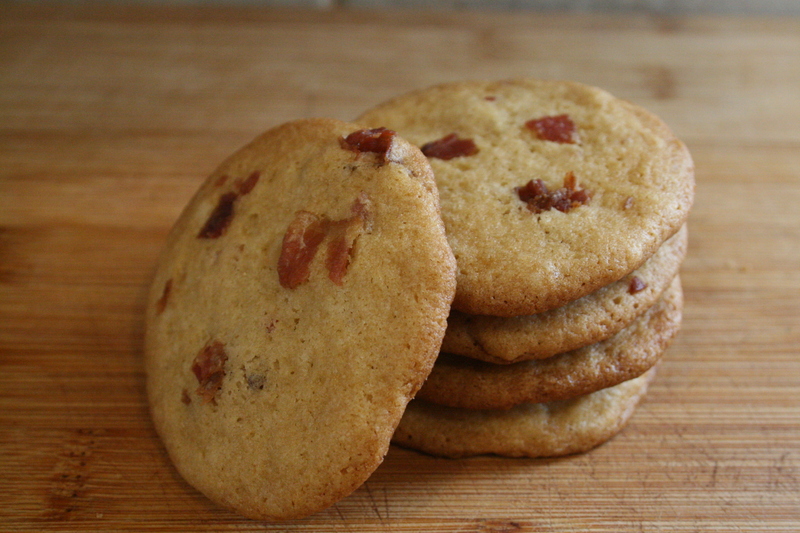 They came out of the oven heavenly, syrup-y, and packed full of bacon. 1. Cream together the butter, sugar, and the egg. 2. Add in flour, pancake mix, baking powder, and baking soda. 3. Gently pour in maple syrup. Mix well. 4. Add half (6 slices) of your bacon. Mix until there is bacon in all of your dough. 7. Heap teaspoons of the dough onto greased cookie sheets. Using your teaspoon, gently press down the top of cookies. 8. 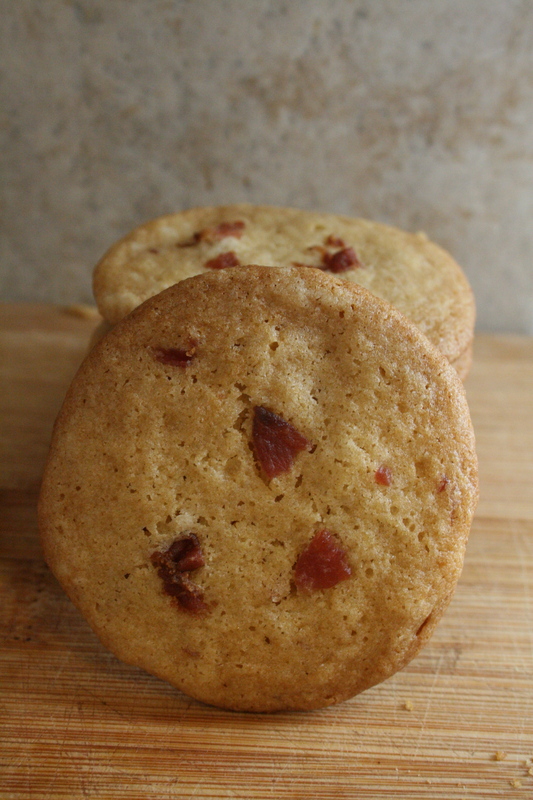 Add two or three pieces of the crumbled bacon to each dough ball. 9. Bake for 10 minutes, or until cookies are slightly golden. Don’t you wish you could enjoy some of these leftovers with us? You can! Visit The Leftovers Club online for more details! This recipe has been entered into the Safest Choice Eggs recipe contest hosted on Bakeaholic Mama and Buns In My Oven. This entry was posted in Desserts and tagged bacon, cookies, dessert, maple syrup, pancakes, savory, sweet. Bookmark the permalink. I saw the title of your LC delivery on Jen’s spreadsheet and I was like…What?? These are so cool! What a fun idea!! These are totally appropriate for breakfast, right? They’re totally appropriate for breakfast….and lunch….and dinner! Talk about a good excuse to have cookies for breakfast! Gotta try this! yeah I want these for breakfast!! So….one could totally eat these for breakfast right? 😛 What a great flavor for a cookie! Such an AMAZING idea! It’s like breakfast for dinner, but ten million times better. Love it. I love this! I am always the person that puts maple syrup on their bacon, so totally up my alley. Breakfast in a cookie? You are a genius! Then you should definitely make these for him! Are you kidding me?! These are so fun!! Thanks so much for entering the contest!